Okay! Musume Time: [℃-utie Week] Before They Fizzle Out Like A Static Shock, Let's Live In This Dream and Experience ℃-ute's Singing Some More! 'Mugen Climax / Ai wa Maru de Seidenki / Singing ~Ano Koro no You ni~' Single Review! [℃-utie Week] Before They Fizzle Out Like A Static Shock, Let's Live In This Dream and Experience ℃-ute's Singing Some More! 'Mugen Climax / Ai wa Maru de Seidenki / Singing ~Ano Koro no You ni~' Single Review! We are coming to a close on our Week with ℃-ute, but please, do not fret! We still have one more post after this one, and then a collection of Graduation Appreciation posts to look forward to! It is extremely sad, however, to know that the group and their activities will soon come to a close. Until that day happens, however, let's enjoy the small time we have left with them, and listen to the beautiful music they have released. I was originally going to make my penultimate post a PV Review, dedicated to Singing ~Ano Koro no You ni~, however after asking the advice of a friend, she deemed the MV too boring, and thought it best to review the single. After some thought on it, actually, I do think it is better to review the single; it's the perfect combination of ℃-utew's music style, showing off their strengths in maturity, playfulness, and nostalgia. Plus, it's their penultimate release before they disband. How could I pass up reviewing the penultimate single, for the penultimate review? I've actually wanted to review this single, and all of its music videos, for some time now. Though I have only reviewed Mugen Climax, this was one of few releases from H!P where I felt a strong desire to look at each music video individually, and talk about them. I love them all, find them to be great quality, and damn, they all manage to fit their respective songs beautifully! But, because time is precious, and I have little of it left, I will instead focus on the music, and share with you my thoughts on the penultimate release from ℃-ute before they disband and leave our beloved Idol world. Though we aren't looking back very far, it will still be a bittersweet tone of nostalgia that we are entering today. Before they leave us as suddenly as a static shock, let's enjoy the beauty of ℃-ute's songs, just like we did in the old days! Let's experience a dream-like climax in music! Also, good grief, this song makes beautiful use of some classic Beethoven. It works really well to create a gothic vibe that feels both romantic and haunting. It's gorgeous, and I can't get enough of how well the song mixes with Moonlight Sonata to create something modern and fresh to the group, whilst still keeping in theme with their sound style. Mugen Climax is definitely the most intense of the three tracks on this single, and it honestly serves ℃-ute well. It's a very interesting song, to say the least, and shpws off that mature and cool style that ℃-ute have become known for in recent years. The way the song is structured is great, the way the members sound and present themselves feels confident, and I love the energy from beginning to end here. It's amazing, and one of the best displays of the groups vocals I have ever heard. I really cannot get over just how amazing this song is, or how they sound. I have already stated my opinion on the video, however, I want to throw out there that I still enjoy it a great deal. This is a gorgeous music video, one that fits the mature and gothic tone of the song perfectly. The lighting is great, the costumes are awesome, in a modern-meets-old way, and good grief, I want to shake the hand of whoever did their hair and make-up. This music video is amazing, and the setting for it was the perfect choice. Thje perfect visual, for a great song. It's understandable why Mugen Climax is a very recent fan favourite, because it truly is wonderful to listen to. It's an eargasm of absolute pleasure, from the instrumental to the vocals. It's one of ℃-ute's best, and you can see how much they have matured since their debut, and how confident all the members have become as performers and singers. I doubt any other group in Hello! Project could have pulled this kind of song off (at least, not right now), because it does require some form of self-assurance in a persons singing abilities and ability to pull it off in sound, and vision. An amazing release, for an amazing group. They were truly at full power here, and were not scared to show it off. They have left me wanting for more, and wishing that they weren't leaving so soon... Sigh. Okay, so not only is this a good song, but it's also a great music video! And yeah, it's the music video I love the most about this release, however, I do like the song just as much, and listen to it a good deal. I mean, what isn't there to love? It's energetic, amusing, and shows off their playfulness as a unit without being too childish or 'cute'. It's a little like Tokai no Hitorigurashi; it's an entertaining ditty, but it keeps the group up-to-date in their style, without going too far back. I find Ai wa Maru de Seidenki to be the perfect Autumn song, actually. It's a cosy, comforting track that feels warm and inviting, as well as refreshing. The energy and cheer this song brings is absolutely delightful, as well, and the moment I heard it when it first came out, I thought 'wow, this is such a ℃-ute song'. It represents just how joyful and cheeky the members can be, and gosh, I just love hearing how happy they can be! It's one of those tracks where the emotion is apparent and overflowing, in both sound and vision, and I love that about it. There's nothing flat or dull about this song; it's bright, cheerful, and has depth to it. It may sound a little more generic than Mugen Climax does, but you really cannot beat the true happiness of Ai wa Maru de Seidenki. It's infectious, and it will make you smile! The music video is actually one of my favourites from this single. Whilst I love the editing and darkness of Mugen Climax, I truly enjoy the simplicity and tone of Ai wa Maru de Seidenki. It's light, refreshing, the outfits are absolutely gorgeous, and it feels so damn cosy and sweet! This is definitely more of a personal video in its vibe, showing off a more 'private' version of ℃-ute that is cute and playful, innocent and real. It's very appealing to me as a viewer, and makes me like the group even more because of how they present themselves. One of the biggest selling points of this music video is the aforementioned innocence it embodies; it doesn't get childish, nor does it feel like we are watching the members being fake or obvious, but instead plays up to the goofiness of the members, and how delighted they are in the simplicity of something like static electricity and what it can do. The girls still feel grown up and mature, but even grown-ups can have fun in the simplest of ways, too! I love the cheer this video shows, and I love the happiness it gives me as a viewer! It's a treat for the eyes, and I love watching it over and over again, because gosh darnit, Ai wa Maru de Seidenki makes me happy! This is a delightful song, with an equally delightful music video. Ai wa Maru de Seidenki is an inviting, memorable track that is vibrant, fun and a joy to hear. Though it might not be one of the groups most creative works, it is something that will give you a little bit of nostalgia, through the sheer innocence and sweetness that this song holds, and deliver a sense of delight whenever you hear it. 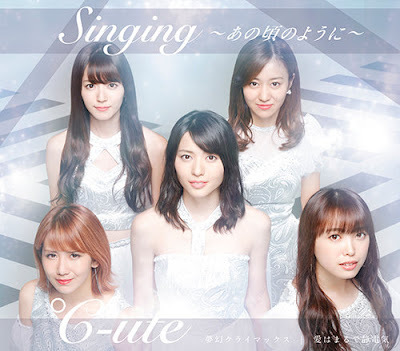 It's a happy song, with a pure, entertaining sound that befits the playful attitude of ℃-ute. It's a good thing they put this one in the middle, too; it sits snugly between two other wonderful songs, and shares all its warmth and love with you, the listeners! So. Freakin'. Great! I feel like people quickly dubbed this as 'the dud song' when it came out. In comparions to the other two, Singing ~Ano Koro no You ni~ sounds a lot more subdued, and to many, it might feel a little boring. I, on the other hand, love this type of song, because we all know I am a lover of ballads and all things nostalgic and sweet, and this song represents all of those things. It's a soft, pretty track that really captures the beauty of ℃-ute's vocals, and delivers a gorgeous message of thanks from the group in their penultimate release. Also, is it just me, or does this track feel like a graduation song? It's one of those songs I want to know they sang during their final live, alongside Gamusha LIFE and Final Squall, to deliver their thanks in full with those three, perfect tracks that create so many feelings, from nostalgia, to happiness and sadness. As someone who does love this song, though, I really do want more people to enjoy it, too, because there's more to it than a simple track and pretty voices. There's emotion and nostalgia here, and it's such a beautiful, thankful piece. It's a gratitude track, and I know that the Western fans prefer something a little more complex and intricate sometimes, but there is beauty and greatness in the simplicity of something like Singing ~Ano Koro no You ni~. Speaking of simplicity, the music video is the simplest of the three for this song, but there really is nothing wrong with that. In fact, this is the prettiest MV, in my mind. It's open, bright, and it matches the tone of the song. Also, I like to think that there is more than meets the eye in this visual display. For one, it's stripped bare, so we're down to the very basics of ℃-ute themselves. No vibrant costumes, no colour, just themselves, so they're putting all their true feelings forward. Secondly, have you noticed the design on the floor? It's a crossroads, but no matter what road they stand on, the members always look the same way, which makes me think that 'no matter where they are, they will always return and come back together'. This may not be the case, but, I like to think of it that way, and it works well with the song, too. One of my favourite aspects of the video is actually the background; I love how it looks like there is a town in the sky, giving me a visual description of 'on top of the world'. It actually does feel like ℃-ute are on top of the world in this release, so that makes the visual even better for me. Other things that I like about it, are of course the use of effects and how subtle they can be, and how they make it look like there is sunlight pouring into the video. The costumes are also beautiful, and the mirror scenes are really sweet and caring. Usually mirrors signify duality, but here, I think it signifies how open ℃-ute are in their closeness and friendship, because it feels very loving, and not at all deceiving. It's a gorgeous video, and honestly, I want to review it at some point. I know people think it's boring and plain, but for me, it has meaning and beauty. It's not just a grey and white MV, but something that feels a little more personal, and represents the group that is ℃-ute beautifully. In both sound and vision, Singing ~Ano Koro no You ni~ might sound and look boring, but if you read the lyrics, understand its feeling and meaning, and look closer at the video and spy things you probably didn't notice before, you realise that there is more to it than how it sounds and looks. Of course, we can't change what we enjoy in sound and vision, but I do want people to see why this song is great, and why it can become special to someone. It's my favourite track on this entire release, and when people claimed they didn't like it, I felt so sad, because this song is not only pretty, but it's also meaningful and personal to ℃-ute. It's filled with their gratitude and memories, and their love for singing. I'm very happy that this song is included, and in this trio of tracks, it is the perfect end to a great beginning. I think that, in terms of song quality and how much I enjoy this release, Mugen Climax / Ai wa Maru de Seidenki / Singing ~Ano Koro no You ni~ is on par with Aitai Aitai Aitai na. It's a great mix of tracks, and it has some really strong, memorable sounds that fit perfectly with ℃-ute's music style and aesthetic, and no track feels out of place here. It's one of my favourite releases from them, for sure, and I love that there is diversity in sound, energy and feeling. Everything works well, and ℃-ute really are at the top of their game in their 30th single release. Looking back at this single, I can't help but think of how, whenever a member or group was graduating from H!P, Tsunku would say that they were at their highest level in performance and singing. For ℃-ute, it really does feel like that, because whilst this single was not their final hurdle, it feels like they were giving their last lap as Idols their full power, taking over every other group in the process. They showed off their vocal prowess, charisma and skills in performance at a higher level than usual, and proved to us all that this is what we will be lacking in Hello! Pro come June 12th. It's a damn shame, isn't it? I feel like a lot of people would have deducted a star for Singing ~Ano Koro no You ni~, but I think it's great. It balances out the energy and charge of the other two songs perfectly, and gives us a beautiful, albeit bittersweet end to the single. Every song on this release is amazing, in my opinion, and in each song ℃-ute demonstrates the power and dedication they have to delivering quality content that is memorable, and just as beautiful as the previous track. There is something in here for everyone, whether you want to hear the cool and mature ℃-ute, the energetic and innocent playfulness of a group of friends, or the nostalgic, bittersweet sound of a group that is thankful for all they have been able to do this past decade. There is something here that will surely please your ears, and no matter what track it is, I hope that you fall in love and appreciate the beauty of ℃-ute. For now, however, please listen to their music and remember the good times. Think back to the joy ℃-ute has brought us, and smile! Until I see you in the next post, please take care, enjoy life, live happily and stay healthy, smile for someone and make their day, and of course. Love Thy Idols. Take care, and smile through the tearful memories. I seriously want to buy this triple A-side at some point. 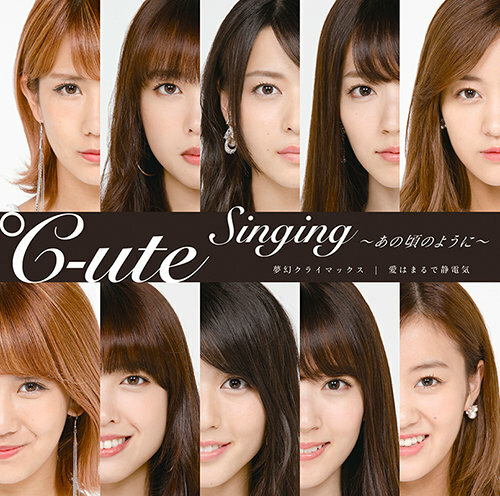 It's an amazingly well-mixed single of tracks that kind of represent ℃-ute as a group (Mugen Climax, Ai wa Maru de Seidenki) and what's coming for them (Singing ~Ano Koro no You ni~). I absolutely agree with everything you've said here. I also felt like Ai wa Maru de Seidenki was such a fitting song for autumn! Plus the girls looked gorgeous, the stylist needs a rise in salary!